BETTER PRODUCTION MMS JUNE 2018 140 mmsonline.com ERP SOFT WARE and material cost for any job with the click of a mouse. The machinists would update the system with the status of each part and every machine, so the system consistently had up-to- date information. 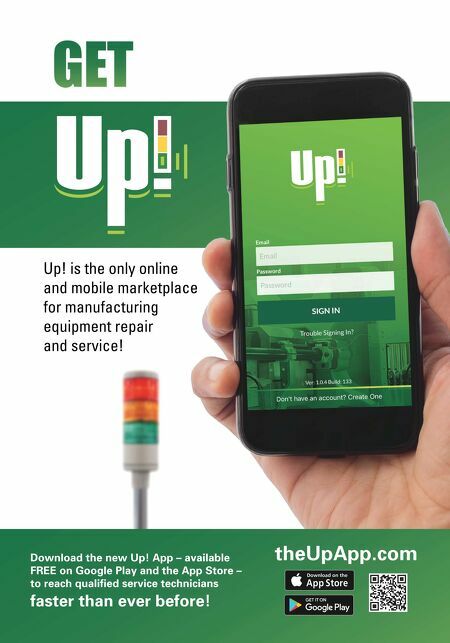 When a job calls for specialty materials or items that need to be manufac- tured off-site, the software alerts users when the orders need to be placed to avoid late jobs due to transportation times. The system has proven especially helpful for jobs that need immediate attention, as Ms. Carpenter can quickly identify the machine space available, know how long it will take to set up and alert her team to the changes. The lengthy quoting process fell to a matter of minutes, leaving Ms. Carpenter free to focus on the rest of her duties. That said, the system required the shop to purchase and maintain on-site ser vers, which can be a sizable expense, especially for small YMW TAPS USA Quality. Consistency. Performance. Z-PRO Economical High Performance Taps YAMAWA YAMAWA YAMAWA YAMAW 1507 E. McFadden Ave. Santa Ana, CA 92705 Customer Service 855-YMW-USA1 855-969-8721 Ph:714-782-0960 Fx: 714-380-6324 www.ymwtapsusa.com Steve Dalton of X-Mil puts data into the E2 Shop cloud-based ERP system. 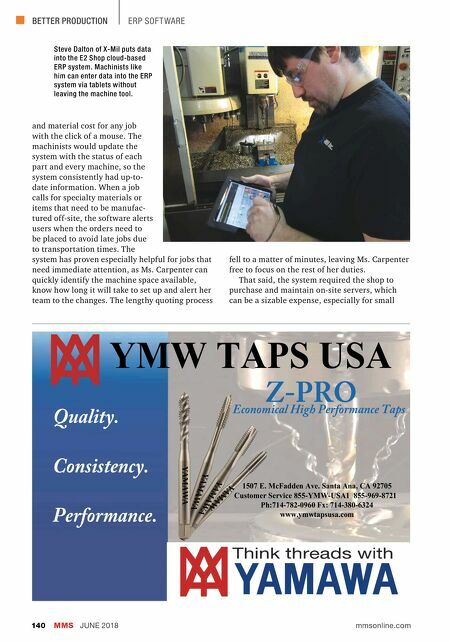 Machinists like him can enter data into the ERP system via tablets without leaving the machine tool.